Begin by sitting in a position that allows your spine to be very straight. Place your feet flat on the floor and place you hands on your thighs with the palms facing up. Become aware of your chakra system and visualize how it interpenetrates your physical and etheric bodies. Visualize the root chakra extending from the base of your spine into the earth and see the crown chakra extending out into the Universe. 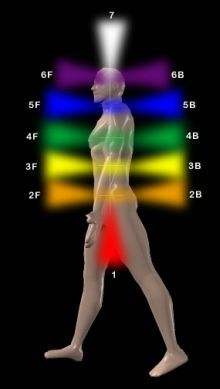 See each chakra extending out from the center of your spine in the front and the back of your body. Become aware of all of your chakras receiving energy from the universal energy field around you and providing vital life force to your whole being. Close your eyes and take several deep breaths. On each exhalation, say to yourself, “Relax, be calm, be still, I am at peace, I am one with the Universe”. Repeat breathing like this until you start to feel a shift taking place in how you feel. Begin focusing your awareness on the root chakra. As you inhale bring your awareness and your breath to the center, the heart of the root chakra . . . Hold your breath and awareness in this position for 3-5 seconds. When you exhale, send the breath out this chakra and down into the earth. On the very next inhalation, draw the breath up and in through the root chakra and bring it to the heart of the 2nd chakra. Hold the breath again at the top of the inhalation and, as you exhale, send the energy out the front and rear aspects of the 2nd chakra. As you do this, affirm that you are cleansing and releasing any blockages, negativity, and resistance that may be in the 2nd chakra. Move through each chakra repeating the pattern above, bringing as many cleansing breaths into each chakra as needed. When your reach the crown chakra, inhale the energy all the way up to the top of the head, and with a strong exhalation, open the crown chakra and send the energy as far up and out into the Universe as you can. Do this several times to extend your reach further out each time. After several breaths, switch the inhalation to start bringing energy down in through the crown charka to the 6th chakra. Using the same pattern as on the way up the body, now you go down the chakras in the same pattern. Inhale to the heart of the 6th chakra, hold your breath for 3-5 seconds and exhale sending the energy out the front and rear aspects of the chakra, affirming that you are bringing in the higher vibrations to cleanse, purify, and heal each chakra. Take this all the way down through each chakra and when you reach the root chakra, send the energy down into the earth. Sit still for quite a while, becoming aware of how you feel, noticing all the subtleties of vibrations around your entire auric field. If you feel that you need any additional cleansing in any of the chakras, you can go back and do so at this time. The final part of this exercise is to inhale both the earth energies and the universal energies into the body at the same time. Go through each chakra using the same pattern, affirming that a balancing and blending of the earth/universe, masculine/feminine, ying/yang is taking place within each chakra. After you are finished, stand up and take a stretch, bend over and touch your feet, so you can hold the feelings within you throughout the day. You may want to create a special symbol of this energy, so that at if at any time during your day you need a quick energy boost, you can visualize this symbol in your third eye and inhale it into your being.